A month or so ago, I posted about a great tonic from Jerry Baker that worked wonders on white powder mildew on plants. The active ingredient was chamomile. I began thinking this week as I tallied how often I use chamomile for various things, and came to the conclusion that chamomile is a pretty amazing little flower. I grow chamomile off the deck in a window box. The seeds sow themselves, so they have come back yearly. I use the flowers to dry and make tea with, like my Nonna did in Italy. 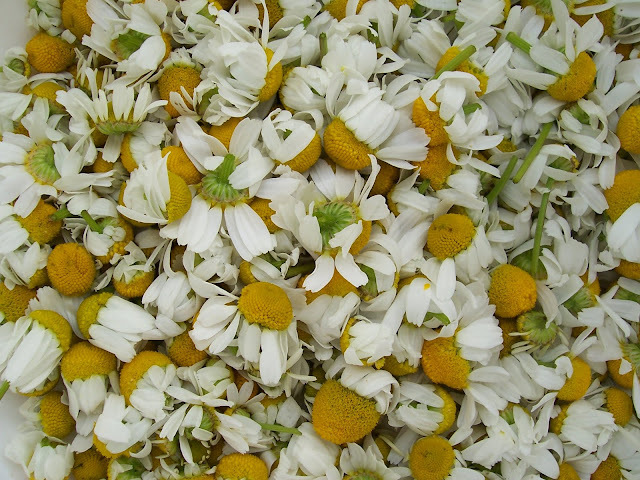 Roman chamomile grows wild in the Italian hills, and many Italians harvest it for home remedy teas. I grew up as a child being given chamomile tea when we had the flu or had stomach upset. My mother also recommended it during the "time of the month" to ease discomfort. I noticed even a very gentle, powdered version for babies when in Italy with my baby daughter. All you needed to add is spring water to it in a bottle and it helped to relieve a baby's stomach upset. I bought a couple boxes to bring back to America (you can't find it here) and I found it did help soothe my daughter if she was gassy or crampy. We now call it "tummy tea" for her, and if she has stomach aches, a small cup of that makes her feel better. I also brew a small sauce pan's worth every 4 months to do a facial steam. I put a towel over my head over the steam and let the steam clean out my pours for 5 minute increments. As you can see, chamomile is a mighty tea in our home. After doing a little research, I discovered why all these remedies were tied to chamomile since the middle ages! Chamomile, at it's heart, is an anti-inflammatory, among other things. SO it seems that whether you ingest it or use it topically, it calms, soothes and brings inflammation down. It also has calming substances that act in various parts of the brain to relieve stress and anxiety, allowing muscles to relax. This explains it's uses as a "before bed", calming tea. -may also speed healing and prevent bacterial infection. -a strong infusion on growing seedlings to prevent the soil fungal disease called "damping off"
-makes a great room refresher. Make a decoction (strong tea) of chamomile and lavender strain and cool. Then pour into a spray bottle and keep handy for daily room revitalization! Great for the bedroom or baby's room.